We haven't really covered the war against ISIS here, maybe apart from the Anbar stadium explosion and Iskandariyah suicide bombing. But Iraq went through much more in recent years. Oil prices have plummeted (and oil provides up to 90% of their revenue) and ISIS made the country more unstable than many had feared. The sports complex is formally located in Baghdad, but practically 25 hectares have been earmarked outside the city itself, just across the road from Bub Al-Sham. That road however is the main route between Baghdad and the north of Iraq, so it's certain to be part of the capital soon. Here three stadiums are planned: the main one with football-specific layout for over 31,000 people, secondary athletic one for 2,000 and small football training stadium with 500 seats. Beside them 2,900 parking places are expected and a 4-star hotel with 500 rooms. Winning design was announced back in 2011. The Spanish concept by TriArena was under construction already in late 2012 and was hoped to be done within a short frame of 20 months. However, political and economic instability in Iraq slowed the project down and eventually led to it being abandoned in late 2014. It wasn't until early 2017 that continuation was agreed. First construction contract was signed with a budget of IQD 116 million but, especially after the currency collapsed, this proved highly insufficient. That's why further $14 million was approved to be paid by 2018. In early 2017 the stadium was given the name of Ammo Baba, famous Iraqi player and manager from the 20th century. 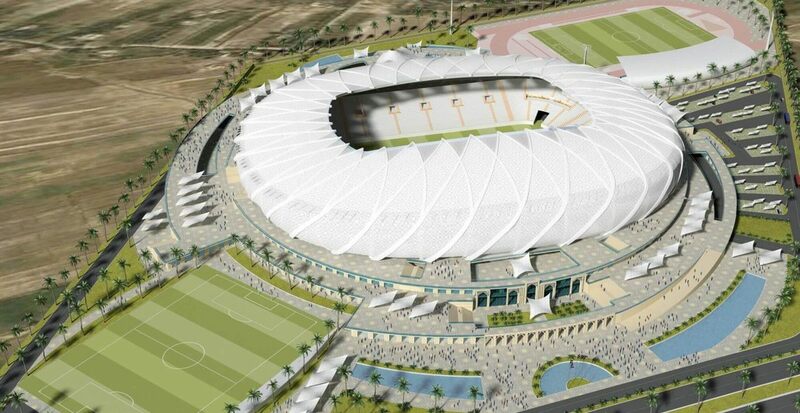 One of South Iraq's most impressive new stadiums will be built in Samawah, though in fairness it won't stand in the city itself. It's planned along the highway no. 8 just south of the city. Designed by renowned Italian office GAU Arena, the stadium uses several different inspirations in its architecture. Well-landscaped ground level and promenades leading to the stands are inspired by ancient Iraqi architecture, while the stadium bowl itself is a modern and dynamic form, mimicking the rose of Jericho. Beneath the white outer skin a single tier of seating was planned, with the west side being significantly bigger than all remaining stands. Throughout the perimeter perforations are planned above the uppermost rows, ensuring natural ventilation of the shaded venue. 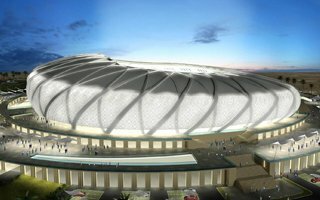 The stadium will be neighboured by a secondary athletic stadium and one training field. Interestingly, most of the parking places will be hidden on two levels beneath the stadium instead of around it.